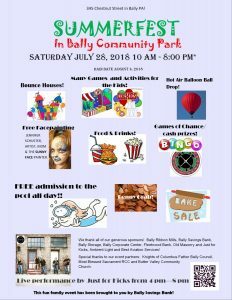 Join us today at the Bally Summer Fest in the Park behind the Bally fire station. Summerfest (see poster) runs from 10am to 8pm. The fire company will be there from 10am to 2pm with our newest apparatus Engine 97-1 – which is housed in Bally. Also on display will be fire prevention handouts, and our fantastic FireAde fire extinguishers. These compact can are a wonderful addition to any home, camper, workshop or shed. 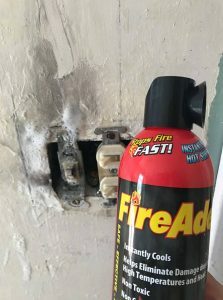 One customer used it to extinguish a fire two weeks after she bought it from us. Join us today from 10am to 2pm in the park behind the Bally Station.